Imam Ja’far Sadiq is the 6th Imam of shi’ites and his Kunyet (title) is “Abu-Abdollah”. He was born in Medina in 73 A.H and his death was in Shav’val 148 A.H. His grave is in Baqi’ Cemetery by the grave of his father “Imam Mohammed Baqir”. His most famous title was “Sadiq” because he never spokes unless the truth. As Hazrat-e Mohammad stated (about him): “ He was the Right word and the messenger of truth”. Also he had several titles such as “Fazil”, “Tahir”, and “Sabir”. Hazrat-e Imam Sadiq (Pbuh) was contemporary with some of the Abbasids and Umayyads caliphates e.g. Imam (Pbuh) was martyred in 148 A.H, at the age of 65 and his Imamate period was 34 years. As it is said he was poisoned by the Medina’s governor, Ja’far Ibn-e Soleyman. The shi’ite Fiqh (jurisprudence) is also called Ja’fari Fiqh that is attributed to Imam Ja’far-e Sadiq, because the major parts of the Islamic legal regulations were enacted by this great man. Considering the social great necessity and readiness, Imam Sadiq took advantage of the suitable political atmosphere and continued his father’s cultural and scientific movement and established a great university in many fields of science. He taught more than 4000 students among them appeared the great scientific characters such as “Hesham Ibn-e Hekam” (who wrote more than 31 books), “Jabir Ibn-e Hayyan”,( the founder of scientific chemistry with more than 200 books in various scientific fields), “Mohammed Ibn-e Moslem”, and etc. The students of Imam Sadiq’s university, who came from every part of the country, were both Shi’ite and Sunnite. Among them “Abu- Hanifeh” was the most important Sunnite students. Both the Shi’ite and Sunnite scholars honored him very much. Since the cultural school of thought of Imam Sadiq (A.S.) considered human beings effective in their fate and told them it is you who form a society! It is you who make yourselves prosperous or unfortunate and miserable. Only you provide the grounds for your progress or your fall. Meaning thereby, it is you who can dismiss the rulers from the seat of power and do not accept cruelty and hand over the ruler ship to the men who are capable and sympathizers. The propagation and spread of this belief and idea, which was the same Quranic belief of the Muslims, displeased and annoyed Mansoor. He tried that he might arrest and stop the flow of this belief by propagation of negative values about morality and corruption of ideas and practices. Thus refrain the people from joining the school of thought of Imam Jaffar-e-Sadiq (A.S.), which is the school of information, consciousness and movement. Mansoor employed scholars for the implementation of his aims so that they may make the people believe in the religion of suppression and constraint. That is to say, they wanted to mould the belief of people and make them believe that whatever poverty, woe, and oppression and excesses are going on, all these are from God and human being do not have any interference to reshape it. So that as a result of it the opposition, revolt and uprising are stopped. People may tolerate the excesses and cruelties of the tyrant rulers and bear the punishments and whips of their criminal masters. They, instead of objecting upon them, may express Commendation and thankfulness. Evidently and clearly Imam Sadiq (A.S.) could not watch the propagation of such a wrong and dangerous belief, which was given to the people and taught in the name of Islamic culture and beliefs. Imam (A.S.) laid the foundation of the Islamic University to combat against this dangerous imperialistic belief. In a short span of time, he trained four thousand students in the field of Islamic culture and beliefs and spread them among the people to get the effects of the propaganda of the agent scholars, neutralized and defused. Surprisingly, the Abbasades gathered the people around them on the pretext of taking the revenge of the blood of martyrs of Karbala and fight against the brutalities of Bani Omaiydes and remove and replace the Bani Omaiydes through the help of Iranians who were inclined to and loved the family of Imam Ali (A.S.) and also with the help of Abu Muslim Khorasani. But instead of handing over the caliphate to the Imam of the age i.e., Imam Jaffar-e-Sadiq (A.S.) they themselves overtook the government. From the year 132 Hijra the period of Omaiydes was discontinued. Two caliphs named 'Saffah' and 'Mansoor' overtook power. The first one ruled for 10 years while the second for a period of 22 years. All the time they teased and annoyed the Imams and religious leaders continuously. Imam Sadiq (A.S.) was under a severe stress and pressure during the age of Mansoor. Even to the extent that sometimes the people were stopped from seeing him. So far so, that when a person named 'Haroon' wanted to see Imam (A.S.) and enquire the solution to a problem. He started thinking what to do to meet the Imam (A.S.). Suddenly, he happened to see a street hawker who was selling cucumbers. He came near him, purchased all the cucumbers, borrowed his old dress, put it on, and pretending to be a cucumber seller went to Hazrat Imam's house and questioned him about his problem, received the answer and returned. Mansoor arrested most of the friends of Imam (A.S.) and imprisoned them and quite a few times decided to martyr the Imam (A.S.) but each time by the miracle of Imam (A.S.) he would be defeated. Mansoor who had been disappointed after using various means and ways, started deceiving public and tried to manifest and show himself as the real heir of Holy Prophet (P.B.U.H.) and one of the persons fit for the post of Islamic caliphate, on the pretext that he is from the lineage of Abbass (Prophet's uncle) and the family of Prophet (P.B.U.H.). But he knew fully well that he did not have the caliber and capability of this and that post only suited the sons of the Prophet (P.B.U.H.) "the Imams (A.S.)." Imam Sadiq (A.S.) severely and strongly combated against this public deceiving conduct and degraded and disgraced this family through his letters. 1. One day Mansoor wrote to Imam (A.S.) "why do you not come to see me like the others?" Imam (A.S.) wrote in his response. "We do not possess any thing from the world so that we may be afraid of you for it (loss of it). You too do not possess anything for the justice day and the spiritualism so why must I come to see you? 2. The next day Mansoor wrote to Imam (A.S.) "Come here to admonish me." Imam (A.S.) wrote replying him, "whosoever be from the people of the world (adorer of world) will not admonish you and whosoever will be the man of the justice day will not come near you." 3. One of the days Imam (A.S.) was present in the assembly of 'Mansoor'. By chance, a fly started teasing 'Mansoor' and howsoever he tried to make it buzz off it would not and again sat upon his far and head. Mansoor much annoyed as he was, "said to Imam (A.S.), "Why has God created the fly?" Imam (A.S.) at once replied, "For the reason of disgracing and degrading the powerful tyrants through them." 'Mansoor' became annoyed; he sat comfortably on his place and allowed the Imam (A.S.) to leave. After Mansoor had martyred a group of the family of Bani Hashim. He sent a man named "Sheba" as the ruler of Madina to keep the activities of Imam under observation. He came to the mosque on Friday and after the prayers were over. Seated himself on the tribune and started taking liberty and using foul language about Imam Ali (A.S.) and the family of the Prophet (P.B.U.H.). People who knew the Prophet's family form a close quarters and loved them got extremely annoyed but they could not dare utter a word. At this occasion Imam Sadiq (A.S.) got up and said, "Oh man! We deserve all those merits and virtues you have mentioned and you and Mansoor deserve those demerits and vices you have spoken about. Then he turned his face towards the people and said, "Do you know who will be the most of the looser on the day of justice, tomorrow. That person who sells his doomsday for the world (material gains) of the others and such is this corrupt ruler." Although Mansoor did his best to bring the Imam (A.S.) close to himself or make him silent by threatening him but he failed. So he decided to martyr Imam (A.S.). Consequently, the Imam (A.S.) was poisoned and martyred on 25th of Shawwal, 148 Hijrah. 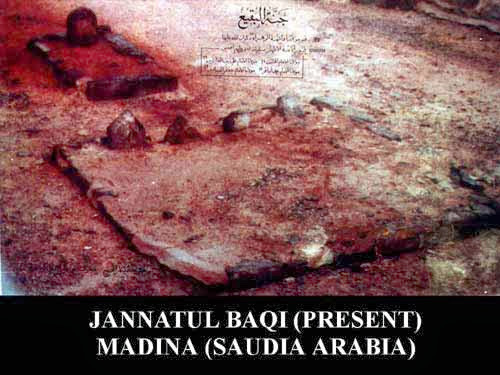 His pure body was buried in the graveyard of Baqi in Madina. We all know that the conduct of men is the reflection of their inner character and everyone can be recognized by his conduct. Whole of the life of Imam Sadiq (A.S.), like the other Imams (A.S.), was the enlightened lesson of the real and right Islam. He himself was considered to be the example and specimen of the Islamic ethic, moral and conduct. You cannot find a father and a son among all the people, of all the tribes who may resemble each other from all the angles of ideas, thoughts, character and conduct. But the family of the Prophet of Islam (P.B.U.H.) and his successors all were on the same line and performed their heavenly duty with one aim, one ideology, and did not have any kind of difference in speech, character and ethical conduct. About the ethical value and virtue of Imam Sadiq (A.S.) it is sufficient that out of four thousands of his students even a single one did not object or criticize upon the moral character and conduct of Imam (A.S.), and did not find a weak point in it. He was a practical example and specimen for the Muslims with respect to eating, relaxing and resting, walking, speaking, and conducts with others. He had the same social conduct with his friends as he had with his children. In the days of Mansoor Dawaniqi, the Abbaside Caliph, I came to kufa with Ibrahim bin Ad-ham. Co-incidently, in those days Imam Ja’ffar ibn Muhammad al-Sadiq (as) also happened to be in Kufa. When the Imam (as) was departing from kufa, many scholars and dignitories escorted him till outside the city of kufa. Prominent people like Sufyan Thauri and Ibrahim Ad-ham were also among them. However, something unusual and very interesting thing happened. In this statement, Imam al-Sadiq (as) has made reference to what is known as Taqwa meaning “absolute obedience to the commands of Allah (SWT)”. Indeed, this is such an attribute which empowers man with extra-ordinary strength in life. The Truthful are those who lead us to the path of Taqwa and they, according to our belief, are the Holy Prophet (saww) and the Infallible Imams (as) from his progeny. Our 6th Imam, Imam Ja’ffar ibn Muhammad (as) is popularly known and refered to as al-Sadiq meaning “The Truthful”. Such was the profound Knowledge and Character of Imam al-Sadiq (as)!